Missouri’s Republican House Speaker says in spite of the passage of right-to-work in Michigan, he doesn’t expect to make it a priority in Missouri but will pursue paycheck protection. 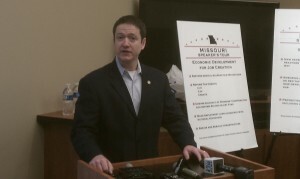 Speaker Tim Jones (R-Eureka) says he supports right-to-work, which keeps union membership or dues payments from being a condition of employment, but he doesn’t think it would pass in Missouri without the backing of Governor Jay Nixon even with veto-proof Republican majorities in both chambers. Jones instead will add to his agenda paycheck protection, which requires unions to get permission annually from its members to use fees or dues for political contributions. Jones thinks that would achieve the same goal as right-to-work, and he believes it can pass. The legislative session begins January 9.